What did Jesus mean when He said to remember Him in the Lord's Supper? Should we just think briefly about His suffering on the cross? Or is there more? When He instituted the Lord’s Supper, Jesus said to do this in remembrance of Him. But what does it mean to remember as used in this way in the Bible? Sometimes to “remember” simply means some fact or event crosses our mind. We fleetingly think about it. But surely the word has a deeper meaning in many contexts. Suppose late one night your wife asks if you remember what day it is. You answer, “Oh yes, it occurred to me this morning that this is your birthday – I remembered,” meaning the thought flitted through your mind. Will she be satisfied? To really remember her birthday means to appreciate the significance and act appropriately according to the consequences: wish her happy birthday, give her a gift, etc. Exodus 20:8 – When God told Israel to remember the Sabbath day, should the thought just cross their mind? Or should their conduct show they appreciated the meaning of the day? Luke 17:32 – Remember Lot's wife. 2 Timothy 2:8 – Remember that Jesus Christ was raised from the dead. Does this just mean the thought should cross our mind? Hebrews 10:17 [8:12] – When God forgives our sins, the Bible says that He remembers them no more. Does this mean the thought will never again cross His mind? The Bible records many examples of sins people committed that God forgave. Does God know what is in the book He wrote? Yes, but He no longer hold us accountable for the consequences of our conduct. We can be sure that He will never again call those sins to mind and punish us as if we are guilty of them. So in the Bible, remembering often refers to recognizing and appreciating the significance of something, along with acting in accordance with the consequences that follow. So What Does It Mean to Remember Jesus’ Death? Some people may conclude that the Lord’s Supper means that we should simply bring to our mind the fact that Jesus died on the cross. So we think briefly about His suffering on the cross and conclude that we have remembered His death. But to truly remember Jesus’ death means far, far more than just recalling the hours He was on the cross. To remember His death means to truly appreciate the significance of that death and its consequences in our lives. If we study New Testament teaching about the crucifixion, Jesus’ death, His blood, and similar concepts, we will find that it affects beliefs and practices throughout the whole spectrum of the gospel. So, to remember Jesus in the Lord’s Supper would include thinking about the significance of His death for our forgiveness, about His resurrection from the dead, about how we ought to live to please Him, about the church for which He shed his blood, and ultimately about the eternal reward that He died to give us. 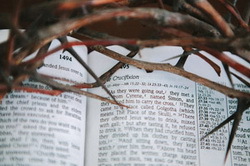 In fact, the death of Jesus relates to virtually every aspect of the New Testament. All of this is remembering the death of Jesus if we understand and appreciate the significance of His crucifixion.